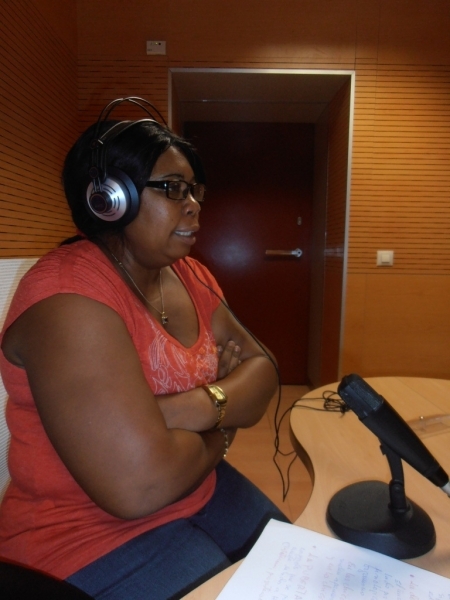 Residents of Equatorial Guinea, a small country on the western coast of central Africa, are tuning in to “The Health Hour,” a new, Jhpiego-supported call-in radio show that offers information to encourage women and families to take charge of their health. The 45-minute segment on Radio Bata is an innovative, community outreach effort by Jhpiego’s Support to the Accelerated Reduction of Maternal and Neonatal Mortality Project. The program offers music, interactive dialogues, interviews and a lively discussion of sexual and reproductive health—all of which make for an interesting show! Jhpiego’s Almudena Gonzalez-Vigil, and her co-host, Ministry of Health and Social Welfare (MOHSW) Regional Coordinator Pastora Ndong Mikue, have produced a series of shows covering topics such as human sexuality, sexually transmitted infections (STIs) and HIV/AIDS. The show complements the work Jhpiego has been doing in country since 2010, building the capacity of health workers to provide quality care and services to women and families to prevent needless deaths. Regional Health Coordinator Pastora Ndong Mikue answers a question from a caller. With funding from Equatorial Guinea Liquid Natural Gas, Jhpiego is supporting the Ministry of Health and Social Welfare to reduce maternal and newborn deaths in three hospitals in Litoral Province. Hospital-based interventions such as training providers and health authorities in essential maternal and neonatal health care, and introducing the Jhpiego-developed Standards-Based Management and Recognition (SBM-R®) approach to quality improvement, are making a difference in the quality of care delivered to Equatoguineans. Despite significant improvements in maternal health over the last two decades, Equatorial Guinea continues to strive to lower its maternal mortality ratio of 240 deaths per 100,000 live births, as well as lower the HIV/AIDS prevalence rate of 5%.1 With limited access to health care information and services, innovative approaches such as “The Health Hour” help ensure that all people—rich or poor, far or near—obtain important, lifesaving information. What are the symptoms of HIV/AIDS and how do you know when you have the disease? Is it possible to have children if you have a cyst? Is there treatment? What happens when a woman doesn’t get her period, then two months later she feels pain and has her period? What would cause this? The idea for the show came to Gonzalez-Vigil when she was brainstorming new ways to educate the local population on maternal and newborn health. Given the country’s small size (a land area equivalent to the state of Maryland), population of 650,000 inhabitants and lack of local press, the answer was obvious. Building on her previous experience from 2007 to 2009 organizing two radio shows, Gonzalez-Vigil began discussions with Radio Bata to negotiate a time slot for the new program. After receiving approval to use some of the State’s broadcasting time allotted for government announcements and events, Gonzalez-Vigil reached out to Ndong Mikue to serve as her co-host. Together, the two women prepared a list of topics to be covered throughout the show’s duration, planning an interview-style discussion for each theme, and collecting concrete facts and “real-life” examples to help listeners relate. With the first series of programs declared a success, Gonzalez-Vigil hopes to continue entertaining and educating via Radio Bata throughout the remainder of 2012. Ideally, she would like to expand the show to include radio frequencies in the capital island of Malabo.